Stems: six to eighteen inches high, leafless. Leaves: ovate, cordate, crenate. Flowers: a greenish-cream, small, in terminal panicles, spikelike, cylindrical, two to four inches long; calyx campanulate; petals filiform or none. Fruit: seeds hispid. This plant is usually found in very dry stony places, among the rocks or on gravelly slopes. It is remarkable for its tall stiff stalks, which are leafless and end in a dense spike of closely-set creamy flowers. The leaves are green and reddish, round, and with wavy margins. It is a peculiar but not an attractive plant. 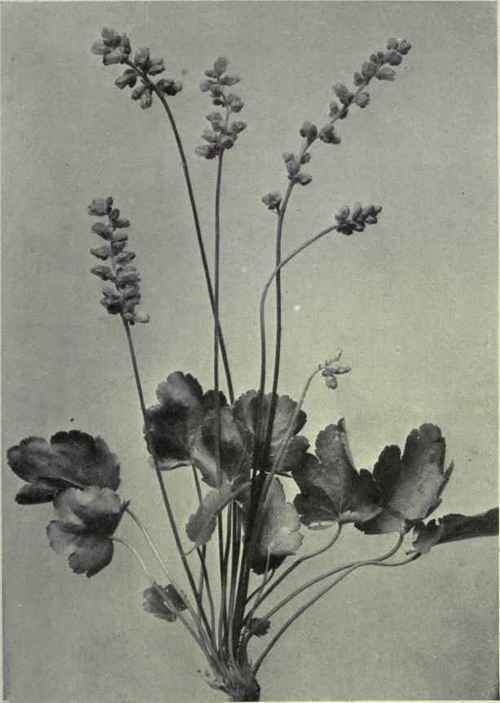 Heuchera glabra, or Smooth Alum Root, has roundish lobed leaves which are doubly toothed; the cream-coloured flowers grow in a loose branching cluster and the style is much exserted. Heuchera glabella, or Bristly Alum Root, differs from the foregoing species in having leathery round-toothed leaves, the teeth of which are bristly at the apex and have marginal hairs. The white flowers are small and grow in a loose branching spike, each branch being subtended by a hairy bristly bract.